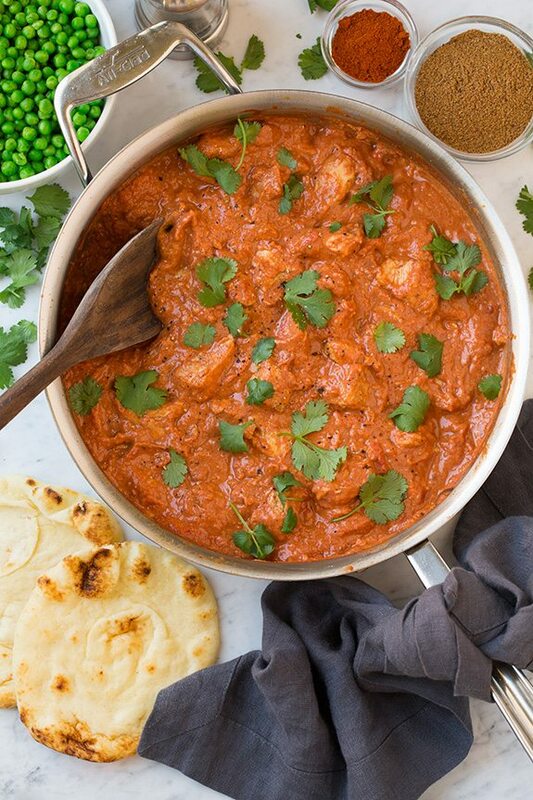 This Chicken Tikka Masala is a flavor packed, restaurant-quality dish that you can have ready in no time! Chicken pieces are cooked in a spiced tomato based sauce and finished Greek yogurt for creaminess. After one bite you’ll be asking yourself, where has this been my whole life?? 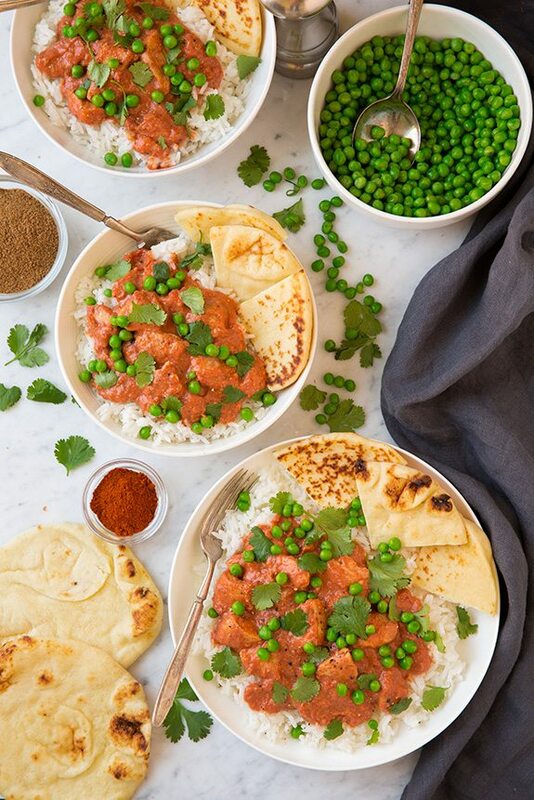 Who knew you could get a perfectly delicious Tikka Masala ready in 30 minutes? Yes, start to finish in 30 minutes! 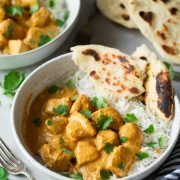 This is a classic Indian dish that is super popular here in the U.S. and one of my favorite Indian recipes. It’s a healthy chicken recipe is totally worthy of being added to your dinner rotation. 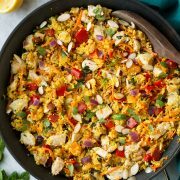 It is brimming with delicious spices and rich flavors and it’s a dinner the whole family will love! In fact this has already become a regular dinner at my house. We love it served with basmati rice and naan too! 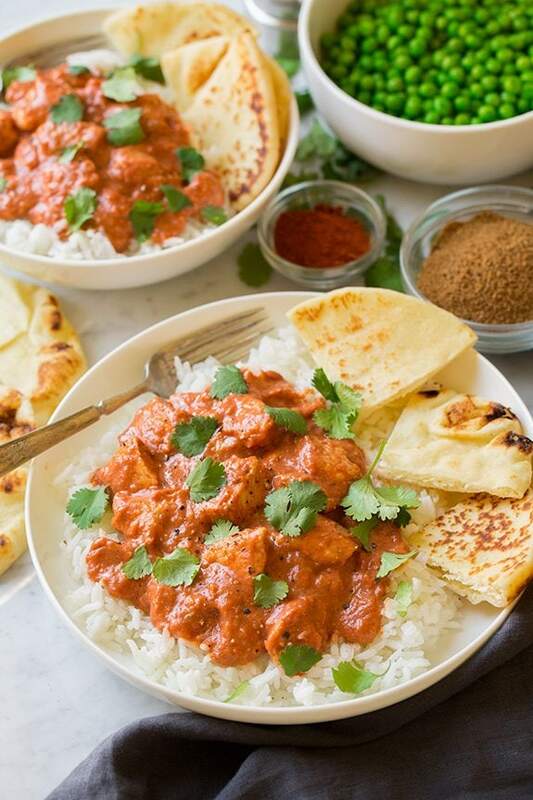 I made my own Garam Masala spice blend for chicken tikka masala, which I would recommend (even though it will add a few extra minutes the first time, it should give you enough for 4 batches of this). I recommend making your own blend because with store-bought versions there are so many different spice combinations and ratios out there for this specific blend. And yes, the cardamom is expensive but you’ll get a lot of meals out of one jar of it (or you can also use it to make chai spice cookies, smoothies, etc. Or make more Indian food because it’s amazing!). The canned crushed tomatoes thickness varies pretty widely based on the brand you buy. So adjust the liquid accordingly. Some brands are thick others are thin and runny so with the thicker versions add more liquid with the thinner versions simmer a little longer if needed or thicken with a teaspoon or two of cornstarch mixed with water. Can I Substitute with Cream Instead? If you want to make it richer you can use heavy cream in place of the Greek yogurt. Just be sure that you let the sauce simmer until it’s fairly thick first or add a little cornstarch in with the cream so the sauce isn’t runny. Pulse ginger and garlic in a food processor. Add onion and pulse until finely chopped. Toss chicken with 1 1/2 tsp garam masala and 1 tsp salt. Cook chicken in a oiled skillet, turning once halfway through, about 7 minutes total. Transfer to a plate. Saute onion mixture in same skillet 3 minutes. Add tomato paste, remaining 1 Tbsp garam masala, the paprika, and cayenne and cook, stirring constantly, 30 seconds. Add crushed tomatoes, season and cook until heated and thickened. Return chicken to pan and warm. Off heat stir in Greek yogurt and lemon juice. 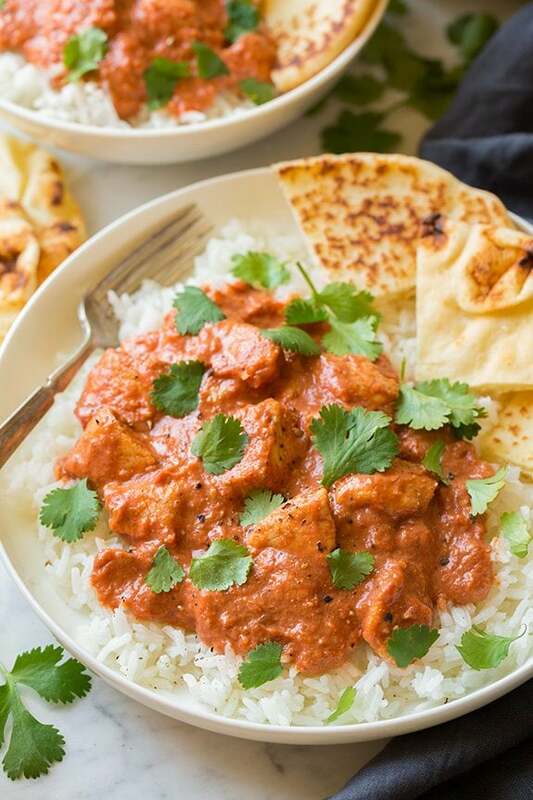 All the flavors of a slow simmered restaurant quality Chicken Tikka Masala but this version is so easy to make and can be ready in 30 minutes or less! So good it may just become a regular in your dinner rotation. Pulse ginger and garlic in a food processor until finely chopped. Add onion and pulse until finely chopped. Toss chicken with 1 1/2 tsp garam masala and 1 tsp salt. Heat 1 Tbsp olive oil in a large skillet over medium-high heat. Add chicken and cook, rotating halfway through cooking, until cooked through, about 6 - 7 minutes total. Transfer chicken to a plate. Heat remaining 1 Tbsp olive oil in same skillet over medium-high heat. Add chopped onion mixture and saute until onions have softened, about 3 minutes. Add crushed tomatoes, season with salt to taste, and cook stirring occasionally until mixture is hot, about 2 minutes***. Return chicken to pan and cook 1 minute longer. Remove from heat, stir in Greek yogurt and lemon juice. 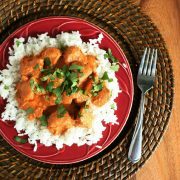 Serve warm over basmati rice topped with cilantro. 1. For a homemade garam masala spice blend (which I recommend using) whisk together: 2 Tbsp ground cumin, 2 Tbsp ground coriander, 1 1/2 Tbsp ground black pepper, 1 Tbsp ground cardamom, 1 Tbsp ground cinnamon, 1 1/2 tsp ground nutmeg. The blend listed here will make enough to make this recipe 4 times so it's quicker the next few times you make it. 2. To make it a little richer sometimes I like to substitute 1/4 cup heavy cream for 1/4 cup of the yogurt. Both ways are delicious though. 3. You can let it simmer longer if needed if the canned tomatoes used were watery. If the canned tomatoes were thick you can add a few Tbsp of water if needed to thin the sauce mixture.